OK. OK ... just one more Glacier shot for now. 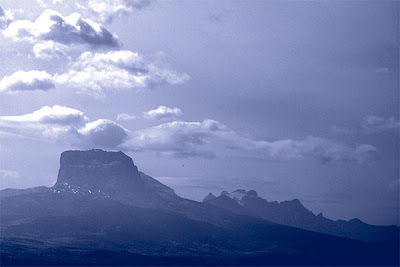 This is a cyanotype-tint shot that I took of Chief Mountain on an autumn day in 2006. I was coming down from Canada and shot this not far from the Piegan customs station. Chief Mountain is one of Glacier's most iconic peaks, and one of my personal favorites ... partly due to the fact that I managed to climb it many years ago. I like this shot. It is blue and misty and peaceful. Thanks, Jen. Kind of a different and unexpected shot, but I somehow liked it, too. Yep, right on the boundary ... and I understand that at least some of the Blackfeet are a little less than enthusiastic about having non-natives climb the thing. I'm not sure if I'm macho enough to climb Chief any more, but you're using the route that I've long wanted to try! When I did it, we spent the night before at the old backcountry campground by Belly River Ranger Station, and then hiked up to Gable Pass and made the climb from there. Not the most direct or least-tiring route, by any means ... the main thing I remember was climbing an endless scree field.